The Council of the United Nations University ― the governing board of UNU ― convened its 66th session on 13 and 14 December 2016 at UNU Headquarters in Tokyo. This session was the second meeting for the current appointed Council members, whose term began in May 2016. The session provided the first opportunity for the new Council members to meet the Directors of UNU’s institutes and programmes. A joint meeting of Council members and Directors on the morning of Day 1 included briefings by the Directors on the work of their institutes and discussions of cross-institute collaboration. Council members also offered feedback and suggestions to the Directors on how to strengthen the work and impact of their institutes. Items on the Council’s agenda included, inter alia, the Rector’s “State of the University” report, the University’s financial status and biennial budget, and a range of strategic, administrative, and operational issues, including ongoing implementation of the UNU Strategic Plan 2015–2019. The Council took particular interest in the issue of gender equality and gender mainstreaming within UNU. Council members expressed their appreciation for UNU’s engagement with the issue, and for the presentation of a new UNU Policy on Gender Mainstreaming, Action Plan on Gender Equality, and Accountability Framework. The Council highlighted the importance that incoming UN Secretary-General Guterres has placed on the issue of gender equality, and his commitment to gender parity among his high-level UN appointments. It noted, too, that UNU has achieved gender parity at the level of the UNU Council, and encouraged the University to make greater efforts towards achieving gender parity at all levels across the organisation. The Council also took interest in the issue of migration, and welcomed UNU’s upcoming chairmanship of the UN Global Migration Group (from January 2017). Council members emphasised the importance of the contribution of their varied migration-related expertise by the UNU institutes, and of the value and importance of University-wide collaboration on this issue. On the evening of Tuesday, 13 December, Council members and institute directors attended a reception hosted by the Japan Ministry of Foreign Affairs (MoFA) at the Hotel New Otani. 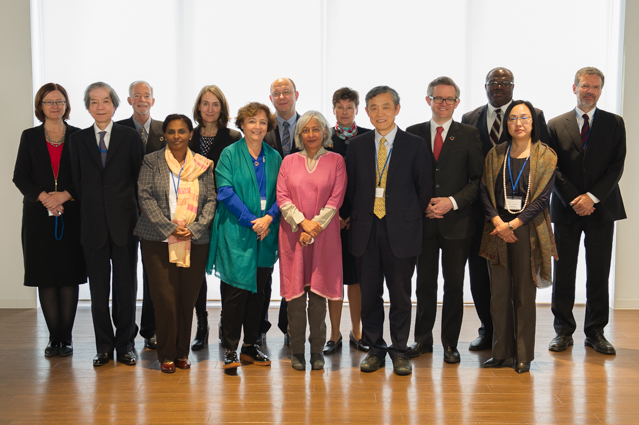 UNU Council members and directors expressed their gratitude for the kind and generous welcome by MoFA, and for the ongoing support of UNU by the Government of Japan. The 66th UNU Council session was attended by all of the Council’s 12 appointed members: Prof. Ernest Aryeetey (Ghana), Prof. Carlos Henrique de Brito Cruz (Brazil), Prof. Simon Chesterman (Australia), Ambassador Elizabeth Cousens (USA), Ms Isabel Guerrero Pulgar (Chile), Dr Angela Kane (Germany), Dr Segenet Kelemu (Ethiopia), Dr Bassma Kodmani (Syria), Dr Radha Kumar (India), Prof. Irena Lipowicz (Poland), Prof. Tsuneo Nishida (Japan), and Prof. Lan Xue (China). Rounding out the Council’s membership are the UNU Rector (Dr David M. Malone) and three ex-officio members: the UN Secretary-General (represented at the session by Mr Thomas Gass, Assistant Secretary-General for Policy Coordination and Inter-Agency Affairs), the Director-General of UNESCO (absent), and the Executive Director of UNITAR (represented at the session by Ms Mihoko Kumamoto, Head of the UNITAR Hiroshima Office).